One of the things I love to do is play tennis. I prefer playing outdoors but the rest of my family likes to play indoors, so when I can get one of them outside to play it is quite the accomplishment. During the early spring, the weather is mild and the fragrant trees are in bloom. Once in a while, a wonderful scented cross breeze goes through the area where the courts are. When this happens it makes it an ideal condition to play tennis, especially when there is warm sunshine and mild temperatures. In fact, it is difficult to stop smiling sometimes when I play tennis outdoors, and I was told that I need to get a game face (which I am working on right now) to be taken seriously. How easy to forget your cares on a beautiful sun filled day like this. This makes living in the Northwest worthwhile even though we don't always see the sun here, sometimes even for long stretches at a time. When the weather is good here it is really hard to stay indoors on a day off. Last July was one of those days. My heart was heavy that day with all that was going on in the news at the time, and I had an injury on my right arm so it was painful to play tennis. The weather was so beautiful that day that my daughter finally agreed to play. During the spring and summer time you can often see friendly swallows flying around the outdoor tennis court area. The same 5 or so friendly swallows seem to play and dart around us as if they recognize us and are glad to see us. I know this sounds impossible, but after that day I wondered, could these birds really recognize us and enjoy our company? I was really glad my daughter was there to witness an incredible moment that never happened before and has never happened again. We must of played on these courts over 30 times before and although we enjoyed the fellowship of these little birds darting past our net after every hit, I really didn't think they were responding to us personally! 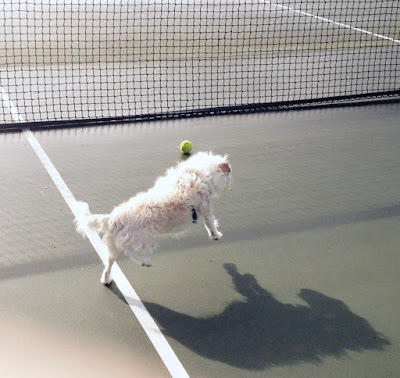 We usually play for an hour and a half but that day we had to cut it really short due to my injury (tennis elbow), so admitting defeat we walked back to the car. Just then, something remarkable happened! The same five swallows that dart back and forth across the nets when we played, circled us as we walked back to the car. Each one gently circled us completely around, one at a time in complete order, alternating right to left about three feet from the ground. Each one taking turns circling us exactly the same way. Some of the most sweetest fellowships on earth are friendships, family and loved ones. I'm sure the fellowships in heaven are even greater.